On Labor Day, President Rodrigo Duterte assured workers that he remains firm in his promise to put a stop to labor contractualization, with a promise of an executive order to back it up. “I stand firm in my conviction to end 'endo,” Duterte said in a speech during the Labor Day assembly in Davao City Monday. 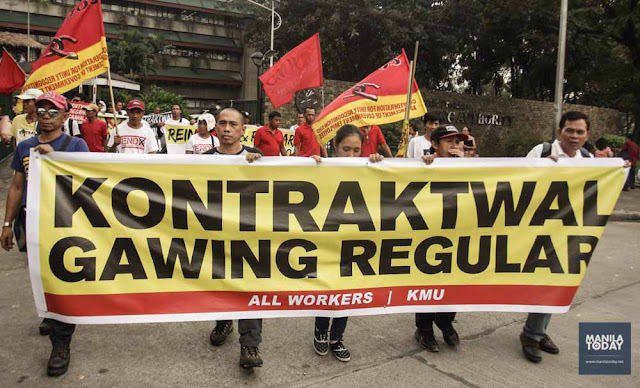 Putting a stop to endo -- the practice wherein employment contracts are deliberately terminated before the sixth month to avoid paying benefits that are due to regular workers -- was one of Duterte’s campaign promises. Duterte however asked labor groups to give the government “more time” to end contractualization, saying it is not easy since some businesses are seasonal. “You have to make the corrections. They are still in the process of doing it,” he explained. Duterte also revealed that he plans to deputize trade unions to inspect the labor law compliance of companies since the DOLE lacks the manpower to make all the necessary inspections. “I further order the DOLE to deputize trade unions and their staff to conduct inspections of all establishments," he said, adding that labor unions should “tell the truth" in their report. Duterte also said he will ratify the International Labor Organization’s (ILO) Convention 151 or the Labor Relations (Public Service) Convention. “May this serve as a symbol of government’s commitment to continuously uphold the aspirations of a corrupt-free civil service,” he said.